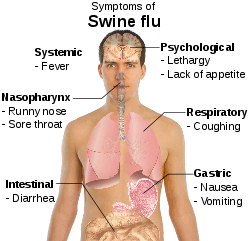 Last Saturday Oct. 24 President Obama declared swine flu a national emergency, stating that it’s an epidemic in need of close attention. The president signed a proclamation allowing federal workers to bypass government requirements in the event of the spread of the disease Friday evening. His declaration demonstrates a hope for speeding up the vaccination process, with additional funding being put forth for the prevention of the spread of H1N1 and restrictions regarding the virus. While some question the severity of the swine flu and believe it’s threat to be overrrated, health officials believe it’s about to explode along with the traditional flu season. Over 1,000 people have died so far from the swine flu in the U.S., including 100 children. The virus has been detected in 46 states and the rate of infected people continues to rise. The unpredictability of the virus heightens anxiety over the danger of this new form of flu. In his declaration, the president hopes to make it easier for sick people to seek treatment and for health officials to administer the vaccine immediately. While the H1N1 vaccine is not accessible as the traditional flu short, it’s available in clinics and various health centers throughout the area. With demand for vaccination surpassing the supply, this formal national declaration seeks to improve treatment and stall the rapid spread of the virus.